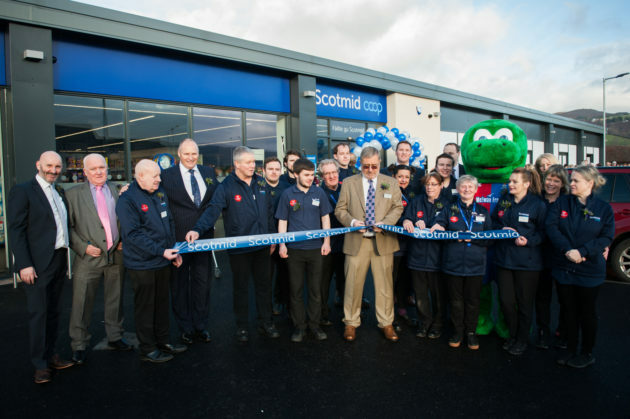 Scotmid marked the start of 2019 by opening the doors to a new state-of-the-art purpose-built convenience store in Drumnadrochit. The community retailer unveiled the new purpose-built 4,500 sq ft store in Drumnadrochit on Friday 25 January, as part of a five-unit complex, situated beside Loch Ness. Local resident and North regional committee member Angus Maclean cut the ribbon to mark the official opening with hundreds of customers queuing up to get an early glimpse of the new ultra-modern store and to receive goody bags containing groceries. A quartet of pipers piped in the new customers through the doors with Inverness Caledonian Thistle mascot, Lionel Nessie in attendance to high-five children and pose for photos. 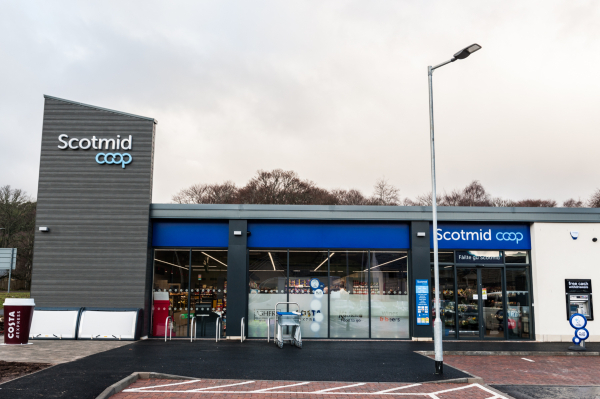 Scotmid have utilised the latest energy efficient technologies to reduce its environmental impact with refrigeration pinpointed as a key priority in the remodelled store design. Refrigeration will also be controlled by a central plant and run on a natural refrigerant (CO2) rather than polluting HFCs. Customers are at the heart of the new purpose-built Drumnadrochit store, which boasts a brand new tailored architectural structure and spacious lay-out, offering an enhanced shopping experience – something Scotmid believe will be well received by the local community. 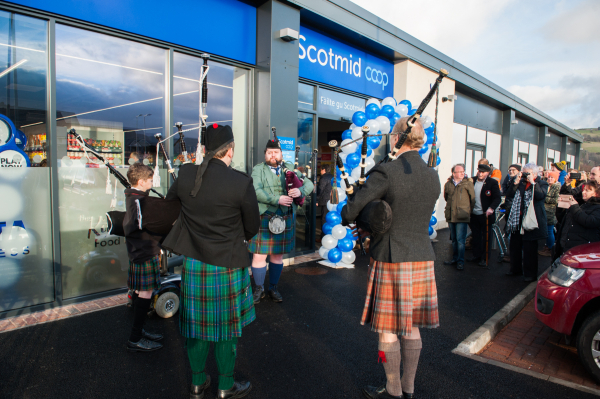 Maurissa Fergusson, Scotmid’s Head of Property and Development, said: “We are thrilled to be able to open the doors to our new Drumnadrochit store, which represents the future of Scotmid. “Our core purpose is to serve our local communities and to improve people’s everyday lives and the introduction of this new store certainly achieves those objectives. “Our aim is for this store to be right at the heart of Drumnadrochit – serving a key role in the lives of local people. “The launch of this store represents another milestone for us in providing convenience stores to match the demands of an ever-changing marketplace and the expectations of our valued members and customer base. Kevin Plant, Scotmid’s Head of Food, said: “We’re incredibly excited about opening this new store at Drumnadrochit – it looks fantastic and we’re certain local people will enjoy what’s on offer. The workforce for the new store, which previously operated from a far smaller site in nearby Balmacaan Road, has doubled from 13 (full-time and part-time) to 27 and the range of all produce is far more extensive – providing a valued service to the local community. The old store in Balmacaan Road was built in 1965 by the MacKenzie family, who had sold meat and groceries in the Glenurquhart area since 1850. So 91-year-old Rosemary MacKenzie, who is the widow of one of the co-founders, her son, Ken and daughter, Dot were all invited to attend the opening event. Ken is a former Chief Officer of the Scottish Co-op before retiring after 29 years’ service in 2008 and is also previously Chairman of the Scottish Retail Consortium – a role currently occupied by Scotmid CEO, John Brodie. The MacKenzie family were given a guided tour of the new store and ‘talked shop’ and swapped stories with new store manager, Alexander Bruce, who has relocated to the area from our Crown Street, Aberdeen store in order to manage the Drumnadrochit shop. 1 Carriers Croft, Lewiston, Drumnadrochit, IV63 6AG, Tel: 01456 459057. Thanks to everybody from the local community, who attended the new store launch – we genuinely hope you love the store as much as we do.